Every business has a legal obligation to protect the confidential information it holds – whether on its staff, customers or suppliers – and failure to do so can result in heavy fines or even imprisonment for the person responsible. This is why replacing IT equipment can cause such a headache. It’s far too easy for sensitive data or information stored on old devices (hard drives, CDs/DVD's, USB storage devices, mobile phones etc) to end up in the wrong hands. Many people believe that formatting a hard drive or floppy disc eradicates all data on that disc, but that is simply not the case. It can quite easily be retrieved with some of the sophisticated software that is now around. 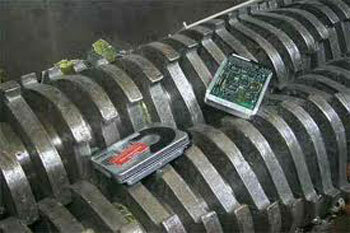 At CommsRecycling we destroy your data by shredding it so no part of your data can be restored or recovered in any way. At Comms Recycling we would never resell your data media to third parties or through outlets such as eBay and we believe the only way to erase data and be 100% confident sensitive information is completely eradicated is to physically destroy the relevant components, which is the method we adopt.